On November 25, 2010 in Kharkov National University of Radioelektronics the seventh interregional job fair “Yang Specialist of the 21st century” has been organized. 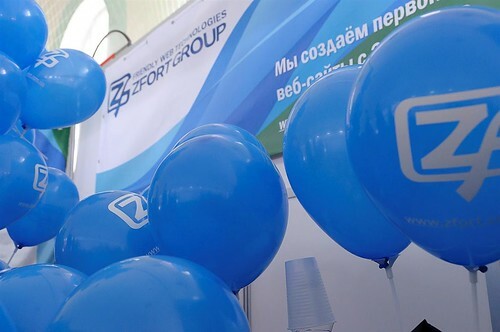 Apart from participation in the job fair where there were more IT companies this year, our company Zfort Group has provided sponsorship. After decoration our presentational place looked very bright, appealing and memorable – the sign was made in corporate colors with plenty of cool souvenirs and brochures about the company. That is why no wonder that all day long we have been telling about the possibilities of work in our company, showed samples of projects and answered questions of the students who crowded near our cubicles. To summarize the Fair it's possible to note one more time with joy and pride that our Kharkov higher educational establishments and KNURE prepare real IT specialists who are ready to work on the real projects. Undoubtedly, the Job Fair on the basis of KNURE is very interesting and useful event both for companies and future IT specialists. We collected a plenty of filled CVs, work sheets, visit cards and there's hope that our company will be eventually joined by young, active and promising specialists.